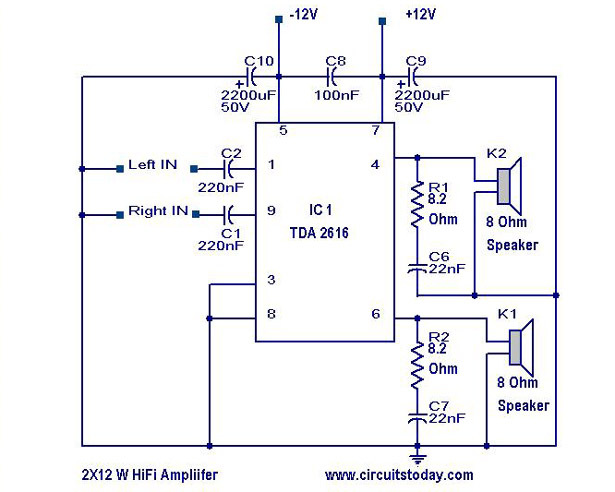 Here is the circuit of a 2X12 watt H iFi amplifier circuit using IC TDA 2616 from Phillips.A quiet simple and robust circuit using very less components.This makes the circuit ideal for a portable power amplifier.The circuit delivers 12 Watts power on 8 Ohm speaker for each channel at +/- 12 V dual supply. The TDA2616 is a stereo power amplifier IC comes in a 9-lead single-in-line (SIL9) plastic power package (SOT131). This IC is specially designed for mains fed amplifier circuits, such as stereo radio,tape and television .The IC has good gain balance of both channels and Hi-fi in accordance with IEC 268 and DIN 45500 standards.Also the IC TDA 2616 has special inbuilt circuit for the suppression of noise signals at the inputs, during switch-on and switch-off.This prevents click sounds during power on and power off. Hi Fi Amplifier Circuit Diagram with Parts List.